​Commercial/Excess Liability Insurance provides businesses with additional liability coverage to help protect them against the potentially ruinous costs of claims. Significant assets can be at risk when businesses are the target of lawsuits. If the cost of a claim exceeds the limits of a business’s underlying primary insurance policies, Commercial Umbrella Insurance extends liability coverage for an additional layer of insurance to further protect business assets. 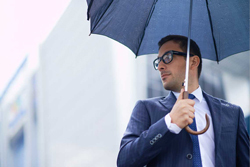 Without Commercial Umbrella Insurance, business owners could be obligated to pay out of pocket for legal fees, medical bills, and damage expenses that exceed the limits of their underlying primary business coverages. ​Each Commercial Umbrella Program offered through Cluett varies by state. The underwriters at Cluett review each submission to match program eligibility and provide a quote(s) when available. ​Please contact our Underwriting Department for questions or information on all available programs. Umbrella/Excess Liability Acord Forms and Supplemental Applications are available to download and print.